Welcome to BIND, Body and Mind Combined our health and wellness website. We are so delighted and proud to present to you our website, which we have spent the last few months working on. Since the beginning, last September, the Transition Years of Scoil Pól Kilfinane have acheived so much during the school year, in relation to health and well being. We decided to channel all that knowledge and share it with the school, community and the world! In their IT class they learnt basic HTML tags, so their new skills were put to good use and a Health and Wellness website was born, called BIND - Body and Mind Combined. This phrase means that to have a happy and healthy life you need to combine your mind and body and not see them as separate entities. You need to look after both equally. During the school year they received and attended very inspirational talks including one from Donal Walsh's father back in early November 2015, and Bressie's talk in UL in March 2016. Articles on these talks are located in the Mind section in TY Experience. As you navigate through the website you will find articles written from individuals point of view and also articles researched on specific topics. The website is divided into 2 sections one on Healthy Mind, (blue background) and the other on Healthy Body (green background). We hope you enjoy this website, may it help you get motivated and back on track to a healthy and happy life. Its not easy but it is definately worth it. If you take small steps at time you will get there! 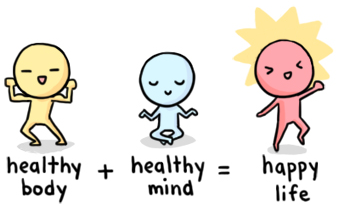 Looking after yourself is the key to a happy life!